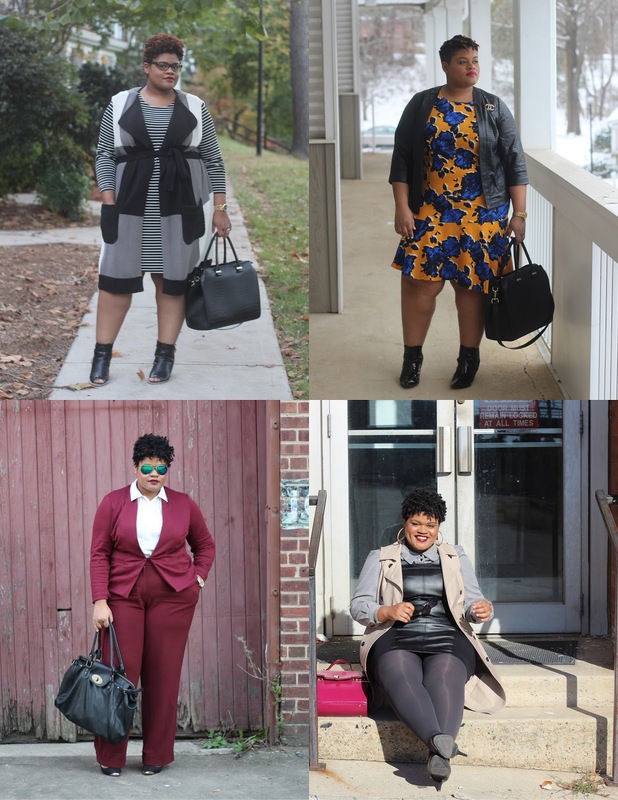 It's that special time of the month where we talk about work wear. I have always believed that your work attire doesn't have to be boring and deserves to have some flare. As we are heading into cooler months, I thought it would be great to share five easy outfits you can wear to work this fall and winter. Fall and winter are two seasons where I really feel you can show your true style because of layering and accessorizing. 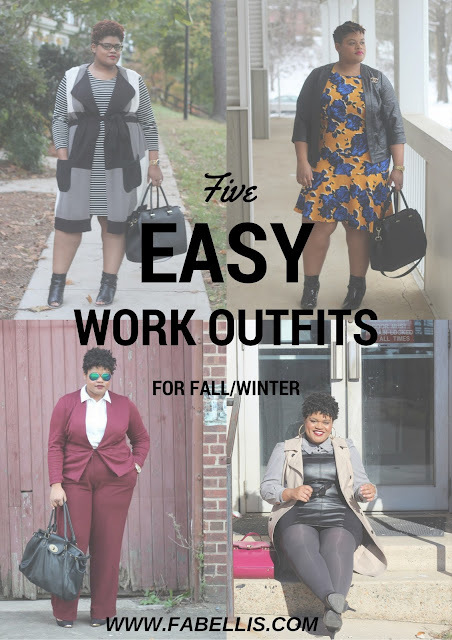 So, let's take a look at some of my previous work wear styles and let me know if you'll be trying one this season! 1. Switch it up and try a colored suit. This summer, I shared what I felt is the perfect suit, but don't forget that suits don't just come in black. Have some fun and wear a colored suit. This oxblood suit is not only a great color, but still professional. To see the full look, click here. If you're not interested in wearing a full suit, try a fun blazer. When I saw this cape blazer last year, I knew I had to get it. It can be paired with so many different pants. To see the full look, click here. 2. Leather is always better. When it turns cool, I'm always itching to bring out the faux leather. Faux leather doesn't have to be just reserved for after work. It can be easily worn to work too. One of my favorite ways to add leather to my work wardrobe is by wearing a faux leather skirt, dress, blazer or top. It's easy to add structure to the look by pairing with button up shirt and/or dress pants. To see the full look, click here. 3. A printed dress is always easy and fun. My love for prints goes all year long. When the Who What Wear Collection was introduced at Target earlier this year, I had to have this dress. Although a bit hard to see, this dress actually has black and blue in the colors so it's easy to add tights and boots/heels for a professional look. When it comes to wearing prints to work, my philosophy has always been to pair it with neutrals to keep it work appropriate. To see the full look, click here. 4. Throw on a sweater vest and stay warm and chic. With the weather being cool in the morning and warming up during the day, layering is key. I love wearing pieces like this sweater vest to work for fashion and warmth. To see the full look, click here. 5. It's cooler, but bright pants will warm up your look. Who says your bright pants have to go away in fall and winter? Keep those bright pants out and pair them with a neutral like black to tone it down and keep your look hot. To see the full look, click here. Which look would you wear to work this season?